In this issue of the project, I review the most recent developments in four countries we have recently discussed – Gambia, Equatorial Guinea, Zimbabwe and the DRC – in all of which long-standing leaders have refused to stand down, in some cases against growing internal opposition and external pressure, but with significantly differing outcomes. In our last issue (no. 7), we focused on the situation in Gambia, where President Jammeh, after losing to Adama Barrow in the presidential election held on 1 December 2016, decided not to accept the official results, appearing on state television to say so on 9 December and following this announcement up with the deployment of troops in key locations in Banjul, the capital, and in Serekunda, the largest city. On 12 December, the bar association called Jammeh’s rejection of the outcome of the elections as ‘tantamount to treason’, on 14 December the UN stated that Jammeh’s response to his defeat was ‘an outrageous act of disrespect of the will of the Gambian people’, and on 16 December, ECOWAS issued a statement saying that ‘Barrow should be sworn in’ in order to ‘respect the will of the Gambian people’. On 17 December, the heads of state of Ghana, Liberia, Nigeria and Sierra Leone arrived in Serekunda to remonstrate with the recalcitrant ‘ex-president’; but were obliged to go home without success. Jammeh announced, on 20 December, that a new election was necessary: ‘I will not cheat’, he said, ‘but I will not be cheated. Justice must be done and the only way justice can be done is to re-organise the election so that every Gambian votes. That’s the only way we can resolve the matter peacefully and fairly’. Striking a defiant tone, he rejected any foreign interference and declared that he was prepared to fight, and would not leave office at the end of his term in January unless the Supreme Court upheld the results. On 23 December, the president of ECOWAS, Marcel Alain de Souza, announced that troops would be ‘sent in’ if Jammeh failed to step down by 19 January 2017. The military intervention would be led by Senegal. De Souza said: ‘if he doesn’t go, we have a force that is already on alert, and this force will intervene to restore the will of the people’. On 27 December, Adama Barrow called on Jammeh to give up power peacefully, and said that he had no wish to lead a country that was not ‘at peace with itself’, but he also promised that he would declare himself president on 19 January 2017. As the New Year arrived, Jammeh remained reluctant, and imposed a state of emergency. It seemed for a couple of weeks as though he would make a fight of it. But when it came to the crunch, Jammeh finally agreed to step down, after 22 years as president. On 19 January 2017, Adama Barrow declared on Twitter ‘this is a victory of the Gambian nation. Our national flag will fly high among those of the most democratic nations of the world’. A key factor in this final decision was undoubtedly the threat of military intervention by ECOWAS troops, who actually entered Gambian territory on 19 January, led by the Senegalese army, and remained on stand-by (with UN Security Council support) as Adama Barrow took the oath of office at the Gambian Embassy in Dakar, Senegal. On Saturday 21 January 2017, Jammeh flew out of Banjul airport together with his family, and headed into political exile, landing in Guinea an hour later. President Alpha Conde of Guinea had served as mediator during the crisis, and appears to have played a crucial role in the last few days before Jammeh’s term of office expired; he left Gambia together with Jammeh and accompanied him on this first short flight. The departure of the ex-president from Gambia came just 24 hours after he announced on state television that he was ceding power to Adama Barrow. As he left, three of his 13-strong fleet of Bentleys and Rolls Royces, were seen being driven onto a much larger cargo aircraft; and it was initially suggested, by the in-coming president, that he had stripped the central bank of its cash reserves to the tune of nearly £9 million over the previous fortnight. It was thought that he was heading eventually for Equatorial Guinea, which has not signed up to the International Criminal Court, and whose President Teodoro Obiang would presumably not be too discomfited by the presence of Jammeh, given his own son’s collection of Ferraris and Bugattis. Obiang, who first assumed office in 1979 as Chairman of the Revolutionary Military Council after a coup, before becoming president in 1982, has himself been in power for 37 years, making Jammeh’s record of 22 years in office seem relatively short-lived. Furthermore, as we remarked, in issue no 4 of this series, ‘the constitution grants Obiang sweeping powers, including the power to rule by decree. Most domestic and international observers consider his regime to be one of the most corrupt, ethnocentric, oppressive and undemocratic in the world. In an interview on CNN, Christiane Amanpour asked Obiang in October 2012 whether he would step down at the end of the then-current term (2009–2016), since he had been re-elected at least four times in his reign of over thirty years. In his response, Obiang said he categorically refused to step down at the end of the term. After the 2011 constitutional referendum, presidents were limited to two terms of seven years (from then on) and the age limit for candidates was removed. In addition, the post of Vice President was established, allowing the vice president to automatically assume power if the president died in office. During 2016, as the presidential elections approached, the authorities persistently harassed and arguably persecuted various civil society organisations considered to be a threat to the government and Obiang’s regime. On 28 February, plain clothes security personnel disrupted a meeting of Citizens for Information (CI) in Bata. CI members Leopoldo Obama Ndong, Manuel Esono Mia, Federico Nguema, Santiago Mangue Ndong and Jesús Nze Ndong were arrested and remained in detention without charge at the end of the year. Over 40 others were arrested over the following days in Bata, and at least 10 others in other towns. On 20 April, four days before the elections, some 140 people were arrested at Bata airport as they welcomed CI’s Secretary-General. Others were arrested later in their homes; they included Gabriel Nze’s sister and elder brother. Some detainees were held at Bata police station and others in Bata prison. All were released without charge over a week later. Several were tortured and otherwise ill-treated, including a man who was made to lie on the floor while soldiers jumped on his hands. On 22 April, police used excessive force against CI members who had gathered peacefully in the party’s headquarters in Malabo. At about 4am, police in helicopters and armed vehicles surrounded the headquarters and used tear gas and live ammunition to force the approximately 200 party members out of the building. Four people were injured by bullets and taken to hospital over 24 hours later, following the intervention of the US Ambassador. At least 23 people were arrested and taken to Black Beach prison where they were beaten. All were released without charge on 30 April. Elections were held in Equatorial Guinea on 24 April 2016. The opposition consisted of individuals with little political recognition and none of their parties were represented in Parliament. There were also three independent candidates, whom critics claimed were dummy candidates to provide legitimacy for the elections. The Democratic Opposition Front, which is a coalition of dissident parties, boycotted the election, citing that the election would be ‘anti-constitutional’ and that Obiang would win ‘with a big score as a result of fraud’. Opposition candidate, Gabriel Nse Obiang Obono, was prevented from running for not meeting residency requirements. Amnesty International reported that ‘the rights to freedom of expression and of peaceful assembly were severely curtailed ahead of presidential elections in April. Police used excessive force including firearms against members of opposition parties. Hundreds of political opponents and others, including foreign nationals, were arbitrarily arrested and held without charge or trial for varying periods; several were tortured’. In January 2016, police in Bata arbitrarily arrested Convergence for Social Democracy members Anselmo Santos Ekoo and Urbano Elo Ntutum, for ‘disturbing the peace’, as they distributed leaflets and announced a meeting of their opposition party. They were released without charge 10 days later. It was announced on 28 April 2016 that Obiang had won the election by an overwhelming margin, as expected. Provisional results showed him with 93.7 per cent of the vote on a turnout of 92.9 per cent. He was sworn in for another term at a ceremony in Malabo on 20 May. He then appointed his son, Teodorin, as vice president. Between February and May 2016, over 250 people were arrested for attending opposition parties’ meetings. All but four of those arrested were released without charge after being held for over a week. Members and sympathizers of the opposition party Citizens for Innovation (CI) were particularly targeted, as were relatives of the party’s Secretary-General, Gabriel Nze. Taxi drivers taking people to meetings were also arrested. In December 2016, Obiang’s son’s lawyers failed to convince the International Court of Justice that he had diplomatic immunity and at the beginning of January 2017 it was announced that Teodorin Obiang was to go on trial in absentia for corruption and money laundering. He had already agreed with US officials to forfeit property worth more than US$30 million (including a dozen luxury cars) but still faces an array of legal cases across Europe. In the meanwhile, his father, the president of Equatorial Guinea, is estimated to have a net worth of some US$600 million, making him one of the world’s wealthiest heads of state. The country over which he has ruled as an elected dictator for nearly 40 years is the second richest in Africa, with the highest average per capita on the continent but (as we reported in issue no. 4) the majority of the population lives under the poverty line. The African Economic Outlook describes the situation succinctly, stating that ‘the country falls short of its economic and financial potential with high levels of poverty (more than 60 per cent), limited access to drinking water and sewerage, and the prevalence of contagious diseases’. 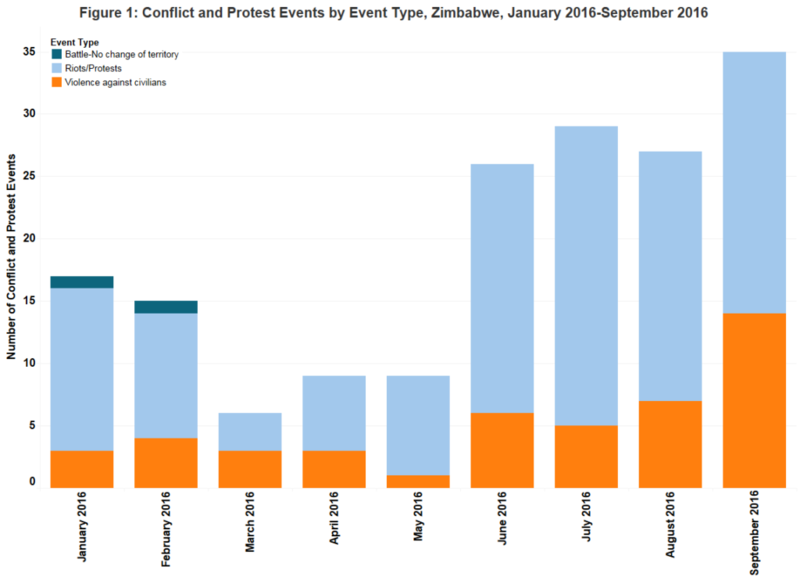 In Zimbabwe, which we last discussed in issue 6, popular protest increased significantly during the period June to August 2016 to peak in September (Fig 1). This spike in violence against civilians came after months of upheaval against the Mugabe regime by protesters from various pressure groups. Protesting against the regime involves a mixture of organised political opposition, unions and seemingly spontaneous social movements. The Tajamuka and ThisFlag campaign represent examples of popular movements which have protested repeatedly against the government on the street and online. ThisFlag seems to function as an avenue by which ordinary Zimbabweans can demonstrate their grievances against the government, with the group’s leader, Pastor Evan Mawarire, calling for Zimbabweans to engage in passive strikes and stay-aways to make their voices heard (ACLED Conflict Trends, September 2016). In contrast, the Tajamuka campaign is focused on forcing Mugabe to step down before the 2018 elections and has been engaged in active protests and riots in Harare and Bulawayo (Tajamuka, 2016). Protesting with these social movements is the National Vendors Union of Zimbabwe (NAVUZ) which is also demanding an end to Mugabe’s administration. In the face of these civil society developments, the conventional opposition parties have become increasingly concerned about losing relevance as the mouthpiece of anti-Mugabe sentiment. They have formed an alliance and also engaged in widespread protest against the government. The alliance includes notable former regime insiders and opposition politicians including Morgan Tsvangirai’s Movement for Democratic Change-Tsvangirai (MDC-T), Welshman Ncube, former Vice-President Joice Mujuru’s Zimbabwe People First (PF) party, Tendai Biti’s People’s Democratic Party (PDP) and Elton Mangoma’s Renewal Democrats of Zimbabwe (RDZ). With President Mugabe and the ruling Zimbabwe African National Union-Patriotic Front (ZANU-PF) facing internal coalition competition and popular discontent, the regime has relied heavily on violence to cow the opposition into submission. The spokesperson of the Tajamuka campaign and the leader of the NAVUZ have both been abducted and tortured by unidentified men suspected to be security agents (according to Dewa, 14 September 2016 and Ncube, 29 September 2016). The manner in which these individuals were targeted echoes the disappearance of Itai Dzamara, who led a protest against the Mugabe regime. This gives a clear message to those orchestrating the anti-Mugabe protests that they can also be made to disappear altogether if necessary. ZANU-PF is also continuing its campaign of violence against the street-level machinery of the opposition with ward councilors from both the MDC and PF assaulted by ruling party cadres. While the regime is seeking to decapitate the unions and social movements by intimidating their leaders, it is aiming to cripple the political opposition by removing its supporters and lower level functionaries. In the meanwhile, the economic situation continues to deteriorate. In October 2016, the World Bank issued a report on Zimbabwe in which it stated that the country had been severely affected by a financial crisis and drought; the economy is estimated to have grown by only 0.4 per cent in 2016, with agriculture having shrunk by 4.2 per cent in 2016, due to drought. Going forward, external payment arrears may lead to a further contraction in imports and a decline in GDP. The financial crisis continues to have a significant impact on incomes, while the drought has disproportionately affected the rural poor (the number of extremely poor people is expected to have increased to 3.28 million in 2016, up from 3.16 million in 2015). Moreover, the number of food insecure people was considered likely to increase to over 4.4 million people by end 2016/early 2017. In response to the crisis, the Government announced a fiscal adjustment programme in the Mid-Year Fiscal Statement presented on 8 September, 2016. This programme included measures to limit the wage bill; but some of these were subsequently reversed. The Bank considered that the economic situation is likely to continue to deteriorate and stated that ‘fiscal adjustment in the form of a reduction in the public sector wage bill is needed to prevent further accumulation of government borrowing from the banking system. Without a fiscal adjustment and/or access to external credit through arrears clearance, the government will have to borrow from banks. This is likely to result in an accumulation of public debt, diminishing investor confidence and limiting Zimbabwe’s growth prospects’. Such a ‘fiscal adjustment’ would, however, cut – or at the very least freeze – public sector wages, hitting civil servants whose pay is already widely considered to be inadequate and increasing the scale and extent of urban poverty. Already, the rate of inflation – which had remained negative throughout much of 2016 – had begun to increase as the price of food, cooking oil and non-alcoholic beverages rose. In the meanwhile, the opposition has continued to agitate for ‘meaningful change’, and has even fallen out with the Zimbabwe Electoral Commission over their demand for electoral reforms – under the banner of a National Electoral reform Agenda – before the ‘make-or-break’ national elections planned for 2018, while the Zimbabwean authorities have continued to control any significant form of collective action. In the most recent confrontation over a ‘mega march’ in Harare – planned for 22 March 2017 and to be led by MDC president Morgan Tsvangirai – the authorities effectively went back on their previous decision to allow this protest demonstration to take place by confining it to the central business district and not permitting a march to take place through the city. The police stated that they had concerns that there was a risk that the proposed march would turn violent. On Monday 19 September 2016, thousands of opposition supporters marched in Kinshasa against President Kabila and his bid to extend his term; there were demonstrations also in Goma in the east of the country. The next day, Human Rights Watch reported that security forces had killed more than three dozen people in the latest bout of protests (other sources reported higher figures), and close to 200 people are believed to have been arrested. Interior Minister Evariste Boshab referred to the protests as ‘an uprising’. The protests, combined with external pressure, had the effect of persuading the ruling coalition to enter into ‘a dialogue’ with the smaller opposition parties, which led to a provisional agreement, announced in October, that President Kabila would stay on until presidential elections to be held in 2018, but would then stand down. The main opposition coalition objected strenuously to this ‘deal’, arising out of talks from which it claimed it had been excluded, and called for another general strike in protest. The ‘dialogue’ continued, however, and pressure on Kabila grew after an opinion poll revealed that his popularity had collapsed to less than 8 per cent. In November, Samy Badibanga, leader of the main opposition bloc in parliament, was nominated by Kabila to take over from Augustin Matata, marking a significant political development. Towards the end of December 2016, a combination of mounting popular tension, poor polling for the president, and pressure by the international community led to the signing on 31 December 2016 of a ‘global and inclusive agreement’ mediated by the Congolese Catholic Church. This involved a transitional government, to be in place by March 2017, a promise that President Kabila would not run for another term, and elections to be held in 2017. Kabila himself promised that elections ‘would be organised in the coming months’, but warned against foreign ‘interference’, apparently reacting to remarks by some UN Security Council diplomats who had come to visit the DRC to push for a peaceful transition of power. Tshisekedi left Kinshasa for Brussels on 24 January 2017 as negotiations on the implementation of the 31 December agreement – which were to be completed by the end of January – stalled over several issues, including the procedure to appoint a new prime minister and the division of ministerial positions. The lack of progress, in the context of deepening economic malaise and insecurity in several provinces, including Tshisekedi’s native Kasai Central, increased popular frustration and tension. On 1 February 2017, Etienne Tshisekedi died, at the age of 84. His death came at a critical moment, as talks between opposition parties and representatives of President Joseph Kabila faltered. He was set to lead a transitional council, as part of an agreement put together in December intended to pave the way for Kabila to leave power in 2017 and refrain from running for a third term as president. Some have suggested that Tshisekedi’s son, Felix, is likely to be named prime minister in a forthcoming power-sharing government, if the agreement holds. On 16 February 2017, the budget minister, Pierre Kangudia, claimed that it would be difficult to collect the funds required to undertake a new census prior to elections in 2017. This claim came only two weeks after the death of Etienne Tshisekedi, believed by many to be the only man with the moral and political authority to unify the fragmented opposition to President Kabila. Close aides of the president continue to insist that it would be impossible hold elections with an up-dated registered electorate before 2018. A report in The Guardian on-line by Jason Burke the same day commented that ‘analysts suggest two possibilities if opposition factions and the government cannot agree on a process with a minimum of legitimacy: a bloody, popular, urban uprising that ousts the president, or the slow collapse of the government as economic weakness, meddling by regional powers and international isolation undermine its authority’. A good deal will depend on the ability of Felix Tshisekedi or Moise Katumbi to orchestrate a coherent and credible opposition. In the meanwhile, Joseph Kabila remains President. Featured Photograph: September 16, 2016 protesting non-organisation of the elections in Kinshasa.